Oil on canvas: 64 x 86.5 cm. 25 1/4 x 34 in. Professor Giancarlo Sestieri has kindly indicated from a photograph that he considers the present work could be attributed to the early career of Luca Carlevarijs ( e mail 27th.July 2017). He describes our painting in detail and relates it to a Naval Battle in a private Venetian collection (circa 1690), and to three canvases in Collegio Padri Armeni Mechitaristic di Ca Zenobio (circa 1682-88). He draws attention to the 1994 exhibition at Padua “Luca Carlevarijs e la veduta venetian del Settecento”, curated by Dario Succi and Annalisa Delneri, where there are several illustrations of juvenile works by the artist, such as naval engagements and port scenes similar to ours. After an early visit to Rome, where Carlevarijs was impressed by Salvator Rosa, Pieter van Laer and Michele Cerquozzi, the artist settled in Venice in 1692 and established himself in the Palazzo Zenobio, the seat of his patron Conte Zenobio. 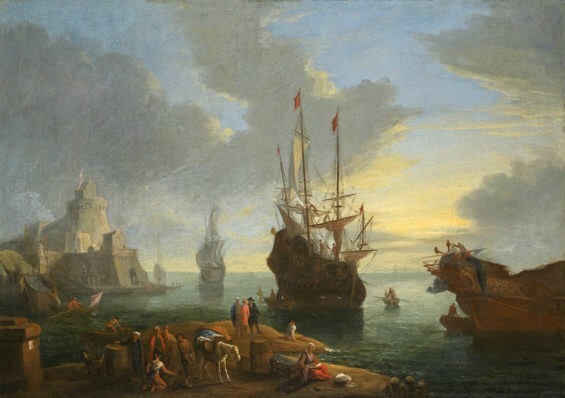 Professor Sestieri points out that in the 1690’s Carlevarijs was heavily influenced by Dutch painters Anton Eismann, Gaspar van Wittel and Jacob de Heusch…..who specialised in richly populated harbour scenes, with animated figures and finely detailed shipping. The landscape in these early views is inspired both by the Venetian lagoons and the Dalmatian coast, then mainly Venetian territory, and the many mediaeval fortifications that defended it. Although still reliant on northern models, the artist’s personality is already apparent in his sun-tipped cloudscapes and the increasingly roseate tones of his palette. He also exhibits a fluency in the painting of the many figures which animate the foreground of his harbours, coasts and ports. This deftly-executed staffage, embracing Oriental figures in turbans and local traders, became the hall-mark of his magnificent, signature panoramas of Venice and its great ceremonies, executed during his maturity. I am writing to enquire about "A Mediterranean Harbour Scene"